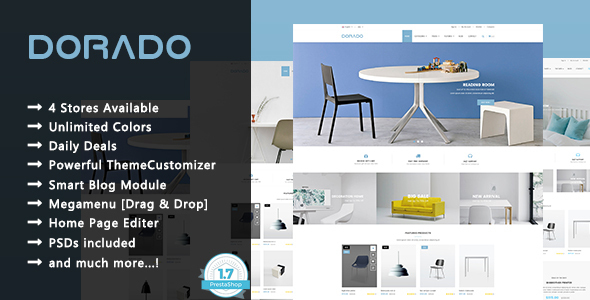 Dorado is the perfect Prestashop template for any Furniture Website. This responsive theme featured with 4 homepage layouts, unlimited color styles, powerful Mega Menu, List and Grid products view, Product Quick view and Product Image Zoom,.. In addition, flexible settings, fast loading, premium modules, fast support and much more. The theme is built with latest web technologies and SEO optimized to make it friendly with search engines.